Birth Date: January 13, 1927. Place of Birth: Ubon Ratchathani, Thailand. 1953: studied Abhidhamma at the Buddhist Association with Mrs.Naeb Mahaneranon, Mr.Boonmee Methangkul. 1956: Dhamma lectures at the National Culture Congress and at the Women’s Correctional Facility, Department of Corrections, Klongprem, Bangkok. 1963: lectured on Abhidhamma at the Buddhist Research Center at Wat Saket Ratcha Wora Maha Wihan. 1967-1976: lectured on “The Foundation for Developing Right Understanding” at the Somdej’s Residence, Mahatat-Yuwarachrangsarit Temple. 1976-2000: gave lectures on “The Foundation for Developing Right Understanding” at the Mahamakut Buddhist University, Wat Bowonniwet Vihara. Lectured on Abhidhamma at Buddhist societies in various universities such as Chulalongkorn University, Thammasat University, Srinakharinwirot University, Kasetsart University, The Royal Thai Airforce Acadēmy, and others. Lectured on Dhamma to many government departments, including the 2nd Wing Division of the Royal Thai Airforce, Lopburi, Siriraj Hospital, Bhumibol Adulyadej Hospital, Phra Mongkut Klao Hospital and others. 1976 to the present: Lectures on Abhidhamma to members of Buddhist Assemblies at various universities, and has presided over Q&A sessions with Buddhist monks, novices, and lay devotees at a number of places in Bangkok and other provinces. 1977: Invited to participate in a Conference on Buddhist Dhamma in Sri Lanka. 1992 and 2000: invited to present Dhamma instruction in the Kingdom of Cambodia. 1998, 2000, 2002: invited to Dhamma talks in the U.S.A.
2002: the Committee of Religion, Art and Culture, The House of Representatives, invited Ms.Sujin and scholars from the Dhamma Study and Support Foundation to hold Dhamma Discussions at Parliament House. 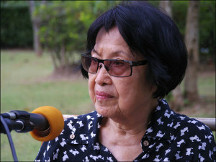 Ms Sujin Boriharnwanaket has written more than fifteen books on Buddhism including “A Survey of Paramattha Dhamma” and “The Conditionality of Life”: Her lectures are broadcast from more than twenty broadcasting stations throughout Thailand. 1985: granted an emblem of honour by Her Royal Highness Princess Sirindhorn in recognition of the great benefits derived from her total dedication to Buddhism. May 30, 2002: Honorary Masters Degree in Religious Studies (Buddhism) from Mahamakut Buddhist University. March 7, 2007: Outstanding Award for Women in Buddhism, on the Occasion of International Women’s Day by the United Nations. May 25, 2008: Honorary Doctorate Degree in Religious Studies (Buddhism) from Mahamakut Buddhist University. April 22, 2009: Emblem of Honor presented by the Committee for Religion, Art and Culture of the House of Representatives. Present Position: Chairman of the Board of Directors of the Dhamma Study and Support Foundation, registration no. 2522, August 1, 1984. Address: 174/1 Charoen Nakorn 78, Dao Khanong, Thonburi, Bangkok 10600, Thailand; Tel: +662-468-0239; website: www.dhammahome.com.